The district of Glencorrib is part of the Lakes District of south Mayo and is located just south of the village of Cross as indicated by the large red dot. As the name itself suggests, it is the glen by the Corrib, one of the largest lakes in Ireland. It is here that you feel you have at last experienced the true Celtic meaning of glen from the Gaelic word gleann or gleantán, and one would travel far before enjoying again such tranquillity and natural beauty. Back then, though only in primary school at the time, I thought the De Profundis was an essential part of the mass that was binding on all Catholics the world over. It was only later when in college in Cork that I learned its true significance as a special prayer peculiar to Ireland. "Out of the depths I have cried to Thee O Lord; Lord, hear my voice ...." Around our area at least, it was seen as an earnest plea to the Lord to set the spirit world at rest, a world that seemed to be leaning so heavily on the natural world of everyday. It was as if the two worlds needed to be separated from each other for the eventual well-being and peace of mind of the living. It would indeed be very difficult to convey in a fairly convincing way to the modern reader or the youth of today what it was that people back then believed they saw and experienced in those troubled times. The De Drofundis, introduced so to speak as a type of spiritual antidote, would have had a special cathartic or cleansing effect that gave people comfort and made them feel better able to cope. 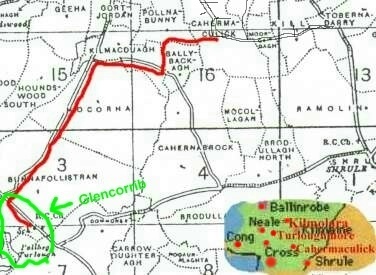 The red line on the map shows the route we followed from our home in Cahermaculick to our Grandparents' home in Glencorrib. We crossed the fields and joined up with a boreen that took us to the Ballybackagh Road. To have followed the road from home around by Ardmoran and Gortjordan would have added a couple of miles to the trip. From a young age we would often travel on our own walking all the way. Whenever one of us travelled with Mam, she took her bike which we lifted over the walls till we reached the boreen. From then on it was pedal power with junior sitting on the carrier. The bike and the horse drawn trap and sidecar were the main means of transport. There were few cars and trucks because of wartime restrictions. By the time we were about ten we had our own bike or something that looked like one, or we borrowed Dad's where we had become adept at peddling under the crossbar, holding onto the handlebars with one hand and the saddle or thereabouts with the other. During the Autumn months, we made many stops along the way to pick the freshly ripened blackberries, sloes and wild strawberries, and closer to Glencorrib to pick the many hazelnuts from the trees along the road. Directly across the road from my Grandparents' home was a large hazel wood which no doubt explains why the nearby road is known as Wood Park Road. Many an hour we spent as children exploring the wood with its many burrows and nests including the wren's among the briars, and eating our fill of hazelnuts. The wood has gone now and 'its airy cages quelled' as the poet Hopkins said of another. No more 'the leaping sun ....the sandalled shadows...(the) wind-wandering'. Gone also are the old thatched home and that magnificent trap used by my Grandparents whenever they came to visit us. If only I had a photo of it! They never missed that special occasion such as our first communion or confirmation. They were there to take us in their trap all the way to our parish church in Kilmaine and back again. Suspend disbelief for a moment and imagine this 'most' perfect trap, beautifully painted and polished and gilded towards the top, flawless and pristine, with rich leather seating and black and golden lanterns mounted on each side at the front, and drawn by the proudest black stallion, majestic in every stride and movement, dressageful for ever in his fine gear and plaited mane and tail and shining hooves, with his spotless leather reins extending through golden rings mounted on the front of the trap to his master, himself attired in the finest from his gentleman's hat and fur-collared black coat and leather gloves to his golden buckled shoes as each the other complemented, and you dear reader have now a picture of what it was that we were so excited about and now cherish. I have some very vivid memories of those times and our visits to Glencorrib in the forties and early fifties. In preparation for the saying of the rosary, begun on the dot of 6 o'clock, Grandfather Murphy rearranged the kitchen chairs for us to kneel by. My Grandmother always faced the hob on the right of the open fire watching whatever it was she watched on the hob for the duration of the rosary which was begun by Grandfather with extraordinary flair and petition. That look of disapproval on his face should have been enough to remind us to have our rosary beads. But forget we did and of course we were all expected to take our turn at saying a decade of the rosary causing us to substitute the rungs on the back of the chair for beads. That worked fine on the couple of times that I was visiting on my own but proved an absolute disaster when accompanied by my mother and one or more of my brothers. The looks and giggling began whenever one of us started counting the Hail Mary's on the back of the chair, and despite every effort by Grandfather to control the situation uncontrollable laughter took control, especially of Mother, with the resultant postponement or abandonment as invariably happened of the rosary to grandfather's annoyance. The rosary itself was easily the shortest part of this prayer routine. Grandfather knew a litany of litanies and prayed by name for all his relations and friends who seemed to number many hundreds. I couldn't get over the number of animals he owned at rosary time! I can as it were still see the burning sheaves and the big straw ropes across the road at the top of the hill between my Grandparents' place and the church. I couldn't have been more than three at the time but my memory is a vivid one of that special occasion which I believe was the wedding of Bridie Biggins and Jim Browne. All the music and set dancing that evening in Murphy's old loft with lots of people sitting on bags of corn or grain! I remember being outside in the yard with my brother, Sonny, just below the loft when he fell over and a sharp piece of stone pierced the right side of his face just above the eye. The mark is still there today. He had been treated to some poteen by Uncle Sonny Murphy at the ripe old age of four. Uncle Sonny never forgot the incident anymore than my brother, and occasionally reminded him that he was the first of the Colemans to become inebriated. And as my mother said to my Uncle in 1986 when we were revisiting our youth, "O Jesus, Mary and Joseph, wasn't it an awful thing for you to do!" I wish I could adequately describe and portray my Grandmother, Bridget Murphy. To me she was the embodiment of nearly two thousand years of Irish history. You don't see or meet or hear of people like her anymore. She was the last of the truly Celtic women whose demeanour, traits, customs and superstitions, as well as her spoken word, which in itself was a fascinating mix of lyrical 'old' Irish and English, placed her anywhere in traditional or Gaelic Ireland between 400 and 1900 AD. In her met Maeve, Deidre and Dark Rosaleen and those who wrote the Táin were surely thinking of women like her. Everything about her speech, not just its vocabulary and structure but also its pitch, its tone, its inflections and intonation patterns were of a time past and culture lost. No one, not even in the most Gaeltaght part of Ireland speaks like that anymore. It was so proud and haunting and so elegant and rich from beneath that shawl. The Glencorrib annual sportsday provided an unique bonding experience for the local community and its many visitors. We set off from Cahermaculick bright and early on the day, crossing the fields and running a good part of the way in order to be at Grandparents' place nice and early. It was like a clan gathering with all the cousins and their parents meeting for a great day of celebrations. Grandparents were always generous but on this day it must have felt like one of great annual sacrifice to them because they really excelled themselves. Grandmother would call you aside, whispering, 'Sure a Grá, how much did himself give you now?' If he had beaten her to it, she gave you more, as much again and an extra sixpence or so. And, naturally, if he hadn't beaten her to it, you waited with great anticipation for himself to repeat the performance! Ah, but for the innocence of little children how easy it might have been to double the amount! So off we set, the young millionaires, up past the church and finally through the gate, which Uncle Sonny and cousin Tommy Biggins controlled, and onto the sportsfield itself without any reduction in funds. It was such a great fun day full of action and colour. Uncle Sonny was in charge of a number of events, or so it seemed to us anyway. He saw to it that we took part in a few of the novelty ones, and so what could be better as that meant a lamhful of sweets at the finishing line. I often wonder how we were so enthusiastic watching the field events, the cycling and the tug-of-war with such interest. John Joe Tedders from Shrule was my hero. What he couldn't do with that bike as he cut the track around the field in pursuit of yet another victory! In sprint events in particular, he made the other cyclists look as if trailing in slow motion. He made it look so easy and even in the longer races where he lapped and lapped again the other cyclists there was never the need for him to enter the sprint mode towards the finish. We all knew John Joe and his father, Jack Tedders, as our local postmen. John Joe was a fine athlete and must have monopolised cycling events for many years both locally and further afield. It was during our trips to Glencorrib that I learned from my Mother most of our local customs and folklore. Some of the local beliefs frightened the hell out of me and I made sure I got home before dark whenever I travelled alone to Glencorrib as so many places along the way were obviously haunted. Whenever we cycled and took the long way around by Gortjordan, we peddled fast to get past the hill just before Gortjordan school while there was still some daylight in case we met the Cóiste Bodhar or Silent Coach that passed by there at night time drawn by two white horses. My mother was convinced that it overtook her and her sister one night and to hear her talk about it, the fright was obviously still with her. The Féar Gorta was a frightening experience and Mother used to point out those fields along the way that had it. If in crossing those fields you were to get the Féar Gorta, you would get so terribly hungry that you could hardly move. This explained why she often carried some bread in her bag to fight the Féar Gorta should it strike you. Having seen what happened to her once when hit by it was more than enough to convince me. I suppose its explanation is somewhere to be found in the memory, genetic or otherwise, of the Great Famine and the other famines to ravish the country. The Fóidín Mearúil was in a few places in Glencorrib. It crept upon you by stealth as you crossed the fields at night. Water appeared before you here and there and to avoid it you started going astray. It was the work of the fairies and to counter it, but it didn't always work, you turned you coat inside out. You had no chance if you weren't wearing a coat. It led you across ponds and rivers without bridges. It was said that when the fairies left you that you knew where you were. My worry was that if I got the Fóidín Mearúil, they might decide to leave me midway across a river. We all saw Jack the Lantern at one time or other and he wasn't such a bad guy at all. He appeared as a ball of light rolling across the fields at night and was thought to herald bad weather, something not too difficult to verify in Ireland's case. But the Bean Sí (Banshee) was another story and surely she must have been that dark and night visitor from the world of evil fairies. The Grim Reaper of more recent times, though male and silent, has reminded me of her more than once. Yet ironically there's something I feel more natural about the Bean Sí. Her loud and mournful crying during the early hours of the morning, in the vicinity of a homestead, told of the impending death of a member of that household. I heard my mother say more than once as night approached on our way home from Glencorrib, "The Lord between us and all harm!" There were so many greetings that were prayers back then. Though I saw my Grandparents a number of times between 1952 and 1958 when I left for Australia, my last memory of grandpa working in the field was in 1952. I had called to visit them before returning to college in Cork. Grandpa was up in one of the fields between the house and pollbeg turlough. That picture of him on padded knees astride drills of sugar beet at the age of seventy five stooped low weeding the beet has stayed with me to move and somewhat haunt me from time to time. I remember my greeting him and his response: 'God bless the work, Grandpa" and "Thanks, dear Máirtín; His blessing I do need on this hard work". There were so many other similar greetings such as "God save all here' instead of "Hi there" when entering a house. Unique and many were the customs and local "piseoga" associated with Easter, Christmas, the first of May (Beltaine), a spring celebration distinguished by bonfires, the first of August (Lughnasa), a celebration of the harvest, the last night of October (Samain), marked the beginning of winter and the night when ghosts and other unfriendly creatures were allowed to frighten the living, not forgetting a host of others associated with animals, birds, death, wakes and funerals. 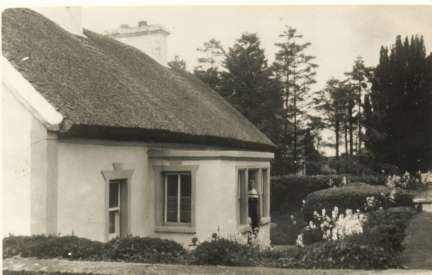 Along the side of that beautiful old thatched home that was my Grandparents' ran a tree-lined boreen back to pollbeg turlough ('pollbeg' means 'small hole'). This is a wetlands area that floods in winter and dries up in summer, though not entirely. I loved that area for its flowers and wildlife and the many tall trees along the way where the crows always nested. On a few occasions I accompanied my grandfather as he drove the cattle there to drink during a dry spell. The boreen though overgrown, as it is no longer in use, is still there but many of the tall trees have disappeared. Though the wood and the old home and all those mainly associated with it, my Grandparents, Aunts, my Mother and Uncle Sonny have all gone, and many other changes have taken place, it is still as charming as ever and I never fail to call there whenever I visit Ireland. In its tranquillity and beauty it will always be that glen by the Corrib - Glencorrib.